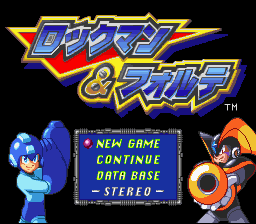 Mega Man & Bass (ロックマン&フォルテ, Rokkuman to Forute?, Rockman & Forte) is a game in the original Mega Man series developed by Capcom. It was released in Japan for the Super Famicom in 1998, being one of the last third-party games for the console. Approximately 4-5 years later, it was re-released for the Game Boy Advance. During development, it was known as "ROCK8.5". 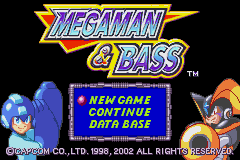 Mega Man & Bass uses graphics from the previous game, and takes place between Mega Man 8 and Mega Man 9. Its relationship with Mega Man 8 is similar to the relationship between Mega Man GB 1-2-3-4 and the original Mega Man 1-2-3-4. In fact, it is a port of a Mega Man game to a platform of lower capability (from the 32-bit PS1 to the 16-bit SNES). 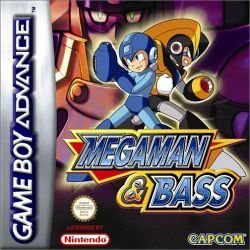 Released in 1998, it's the fourth game where you can play as Bass, after Mega Man: The Power Battle (1995), Mega Man 2: The Power Fighters (1996) and Mega Man Battle & Chase (1997). Localized GBA box art (Europe). Localized GBA box art (USA). This page was last edited on 13 June 2016, at 10:47.